When it gets hot, cooking inside can become a chore. As the old saying goes, if you can’t stand the heart, get out of the kitchen. Men cook out. Somehow even the guys who “don’t cook” volunteer immediately for grill duty. The best thing about a grill — especially a gas grill — is that it is actually a big gas oven and stove top rolled into one. I frequently use mine to cook fish or do some frying as the cooking odours are confined to the great outdoors. Soak the bamboo skewers in water for an hour or use metal ones. Combine and chill whilst the meat is marinating to meld the flavours. 1 Red or green pepper, cut into 1 inch pieces, white pith removed. Add the meat and marinate for three hours. Meanwhile, brush pita bread with olive oil and sprinkle with some sea salt. Grill bread. Spread with the tzitzki sauce, layer in some lettuce leaves if you’d like, and make a sandwich, or serve the souvlaki along with rice pilaf (rice cooked in chicken broth), the tomatoes and bread on the side. Drink a Beaujolais or a Sauvignon Blanc. 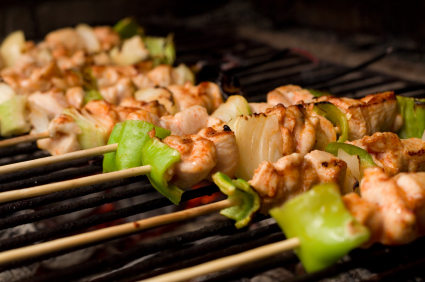 This entry was posted in Entertaining and tagged Grilled Chicken, grilling, recipes, Shishkabab, Souvlaki. Bookmark the permalink. Let’s see… it’s 11:30 here and Richmond is about 4 hours away… Great! I can be there in plenty of time for dinner! I’m hopping on a plane right now . . . swing by the airport and pick me up and we head to the house for dinner. yay. I better get another pound of chicken… and some more ice… .